1 Scrap Quilt This will hopefully start this month as there’s a free quilt BOM I’m planning to make, just using my scraps – I desperately need to sort them out in the next couple of weeks into colours. 2 Tutorials; I’ve not had time to start this one yet. 3 sessions in the garden; March came in like a lion and went out like a lamb. I’ve really enjoyed the last few mild, sunny spring weather in the garden. My three sessions a week in the garden has definitely paid dividends, I finally feel almost on top of the back garden, well as on top as I’ll ever be! I’ve sorted out the area by the compost heap, so it actually looks like part of the garden and I’ve done lots of weeding and pruning. 4 workshops; I’ve got three booked at Fabbadashery in Halifax, the first one is in June, I’m looking forward to it. 5 presents; I’ve now made two presents, I made a bee mini cushion for my mum for her birthday. She loved it. 6 quilts; Just one finished one at the moment, which was the baby quilt for my niece. I’ve got five on the go though (six if you include my Down the Rabbit Hole quilt!) I’m making one for a charity auction which is now sandwiched and just needs quilting, I’m hoping to do that next week. I’ve a quilt for the Care Leavers Christmas Dinners which just needs quilting too. 7 new patterns; I’ve finally used a new pattern, a straight button down skirt, hopefully I’ll use another one this month too. 8 kits; My tally remains at two. 9 mini embroideries; I stitched a vintage map for the Travelling Sketchbooks at Embroiderers Guild, so my tally is two with another one to stitch this month. 10 things; I’m counting two sets of curtains as a ‘thing’, they were for my son’s house, he’s pleased with them. My total so far is now three. 11 cross-stitch smalls; I’ve been quite productive this month with cross-stitch smalls, two were very quick to sew (the bumble bee and the QR code scissor fob) Hello Spring and the cute bunny taking a bit longer. I also made four smalls from cross-stitching I did on bibs and nappy pin cushions over twenty years ago, I’m not counting these in my tally though as all I did was make them up. So four this month takes my total up to nine!!! Almost completed this challenge already! 12 pages in my book; I haven’t started this project yet, though I think I have worked out in my mind how I’m going to do it. 14 drawers organised;I’ve started sorting out all my patterns on the computer, somehow they all end up in different places! I’ve been putting them into folders to try and corale them all. I’ve also started printing off my cross-stitch patterns on the computer, as otherwise they just get lost and forgotton about. I’ve put them in a file so when I want a new project I can just flick through. With previous months sorting I’m counting this as three, even though they weren’t drawers! 15 minutes tidy-up at the end of a sewing session; I’m getting better at this and it does make a difference! 16 books; I’m doing pretty well at reading now, finding different time slots to make it work, such as my train journey to work or the bus journey to my mums. I finished Circling the Sun, I also read Miss Eleanor Oliphant is Fine, this is a wonderful book though it took me a while to get used to the style of writing, I was pretty quickly hooked into the story. It was interesting to see how people can completely misunderstand behaviours and social interaction due to major traumas in childhood. I also read This is going to Hurt by Adam Kay, he was a doctor in the NHS and these are excerpts from his diaries from when he first qualified to being a Senior Registrar. I’ve worked in the NHS for the majority of the last 35 years so I could relate so much to the tales he told, some were very, very funny, but it’s also poignant and sad to read about the workings (or not!) of the NHS and how it affects the staff who work so hard to keep it going. So I’ve read six books this year, I’m pretty pleased with this. 17 blogs a month;I wrote 22 posts in March. 18 walks; I’ve not done so well at this one as my tally remains at three, our plans for walks kept being thwarted. The good news is my toe is fine now after the offending nail was removed (it was falling off following our walk last year!!) I’m now hopeful for the weekly walks we have pencilled in our diaries for this month. 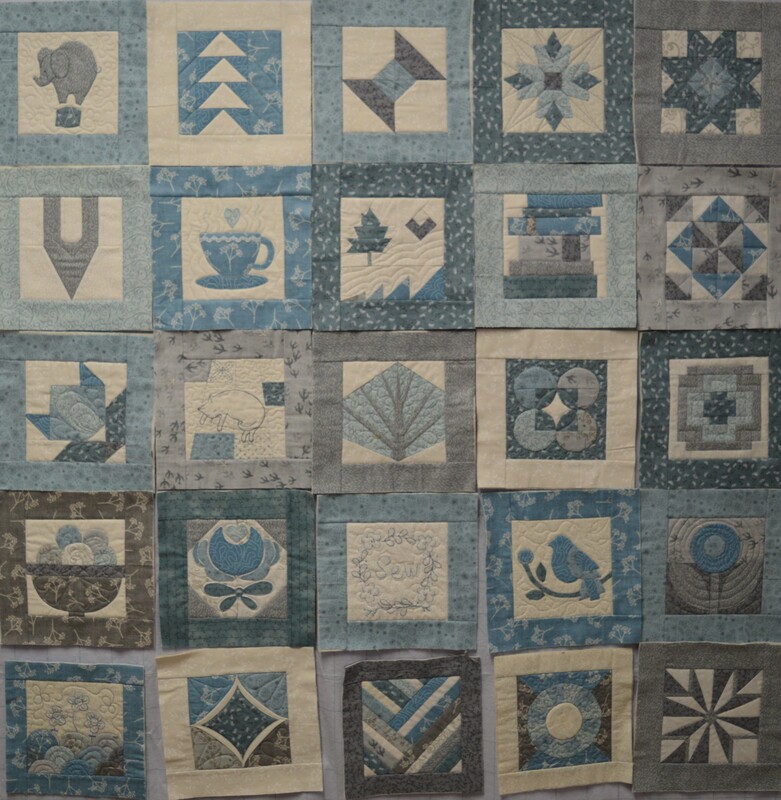 19 Splendid Sampler blocks;This has been on a bit of a back burner this month as I’ve been concentrating on the charity quilt and keeping up with my Coming Home quilt BOM, so what I’m trying to say is I haven’t done any more this month, but as my total is already 9 I’m quite happy! Another busy month sewing wise, my longer term projects have also taken up quite a lot of time, such as my Coming Home quilt, Nature cross-stitch and of course my Down the Rabbit Hole quilt. With a new quilt BOM and a cross-stitch SAL starting this month I really need to get a few finishes under my belt! There’s also quite a few challenges that I’ve not even made a start on so I think I need to concentrate my mind a bit or maybe clear the decks a bit! This entry was posted in Dressmaking, embroidery, Nineteen for 19, Quilting, Sewing, Smalls of the Month and tagged Nineteen for 19. Bookmark the permalink. Just fabulous..amazing all your talents very blessed! I can’t believe how productive you are. Just loving the garden and the little pin cushions are gorgeous. Thanks, I’ve got a bit addicted to the cross-stitch smalls!! What a great effort towards your goals! Well done on the momentum you keep up.